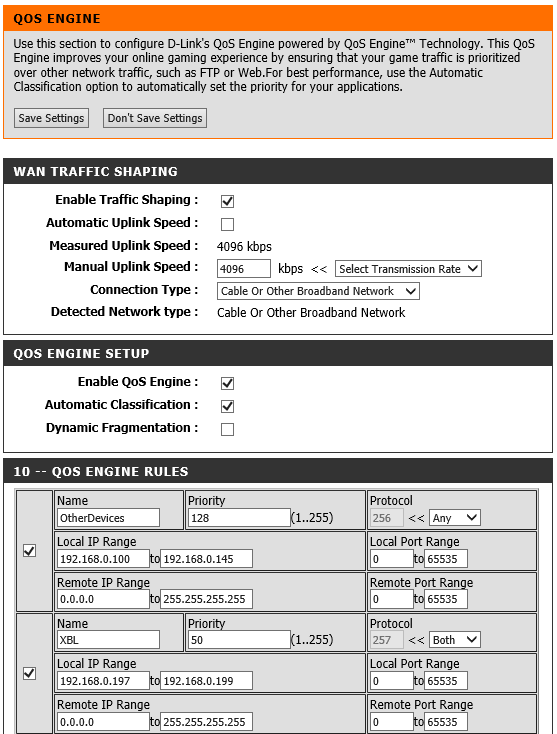 The following settings need to be setup for DIR Series routers. QoS is enabled however not fully configured. This process can be used for a single xbox or multiple xbox consoles. This option is not available on the DIR-857. NAT Status should be open unless your using a host modem with a built in router. 802.11 Mode: G and N mode only. (Mixed All modes can introduce bad performance while using Xbox consoles.) My buddy uses single G mode only. However try using Mixed G and N modes as well or single mode N. If the xbox has the 5Ghz wireless adapter, then try using single mode N on 5Ghz for those routers that support and have the 5Ghz radio feature. 5Ghz is best in Line Of Sight operation. These are proven useful and work great. Please refer to LookIntoMyEyes stick for the PS game console in the FAQ Library for that platform. If anyone uses theses and has the settings please post or send me the information and I can post them along with these settings. Any suggestions, corrections or improvements to this, please post or email me.